For a short time at the end of summer, large amounts of plump, thick-skinned Korean peppers appear in Korean grocery stores at bargain prices. We call them asagi (아삭이) peppers and they are mild, plump, large, and crispy, perfect for making spicy stuffed green chili pepper kimchi, called gochu-sobagi in Korean. They come in season at the end of the summer (and are great for pickles, too), but you can make this recipe any time with any kind of peppers. Use any of your local peppers that are about 5 or 6 inches long, pretty straight, nicely crispy, and plump enough to stuff. I prefer mild peppers for this recipe because the stuffing is pretty spicy, but you can use spicy peppers if you can handle it. This kimchi is crispy, savory, and spicy with a deep kimchi flavor of garlic and fish sauce. 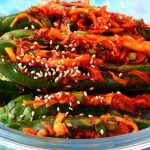 If you’ve been watching my videos for a while you will recognize this sobagi style of kimchi because I made spicy stuffed cucumber kimchi (oi-sobagi) a few years ago, which was very popular with a lot of people. Serve with rice, or as I do in the video, with bo-ssam (pork wraps). I personally like to eat it fresh, right after making it. Like any other kind of kimchi it ferments over time, so best to store it in the fridge and take out what you need when you want it. If you have sensitive skin, be sure to wear rubber or plastic gloves when mixing and handling the spicy mixture, as it might irritate your hands. Good luck with your spicy green pepper kimchi, let me know how it turns out! Throw a pepper onto the cutting board and let it sit naturally. Cut a slit into the top of the pepper as it lays. Repeat with the rest of the peppers so that when the peppers are finished, they stack nicely and sit on your plate with the slit and stuffing facing upwards. Rinse the peppers and strain. Put the 2 tablespoons salt in a small bowl. Rub and sprinkle some salt onto the peppers, into the slits and around the outside. Put them in a bowl and let sit for 30 minutes, then strain any excess water. Mix the radish matchsticks with ½ teaspoon salt in a bowl. Let it sit for 10 to 20 minutes until water comes out of the radish. Add hot pepper flakes, fish sauce, carrot, onion, and chives and mix it well by hand or a wooden spoon. Stuff generous amounts of the seasoning paste into each pepper pocket. Put them in an airtight container and sprinkle sesame seeds over top. 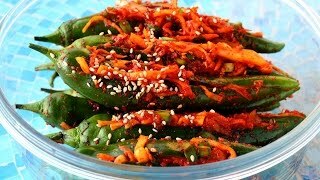 Store in the fridge, and take some peppers out when you want them, like you would other kinds of kimchi. Serve as a side dish for rice. Posted on Tuesday, September 27th, 2016 at 9:32 pm. Posted December 16th, 2017 at 8:10 pm | Log in to reply. This recipe turned out delicious! I can’t stop eating them! Posted December 16th, 2017 at 9:51 pm | Log in to reply. It looks so crispy, juicy, spicy, and pretty! Posted March 24th, 2017 at 12:18 am | Log in to reply. I tried to make green chilli pepper kimchi, its spicy!!! Thank you Maangchi for the recipe! Posted March 26th, 2017 at 10:49 am | Log in to reply. I’d like to taste your bitter melon kimchi! Yummy! Posted October 7th, 2016 at 11:19 am | Log in to reply. still looking for somyeon,chili crush pepper,jjangmyeon noodles,jeotgal. anyone from kuching(pls not far away like jalan song take 30 min use car) can help me to found this stuff? Posted October 8th, 2016 at 11:31 am | Log in to reply. Thank you for letting me know that the store is closed. I just emailed my reader who submitted the store. If she confirms, I will remove the store from the list. Here is a list of Korean grocery stores in Malaysia. I hope you can find one near Kutching. Posted September 28th, 2016 at 7:06 pm | Log in to reply. Oh maangchi, I made these tonight, and oh my gosh they are so good. I think I used a little too much salt, but I really liked them a lot. I can’t wait for my husband to try them. Thanks for the recipe. 꼿게탕 is next on my list of things to try. I love crab. I hope I spelled that correctly. 감사함니다. Posted September 28th, 2016 at 6:11 pm | Log in to reply. I recently moved to a small town in Tennessee where ingredients for some cooking are hard to come by without a long drive. I can get jalapeno peppers locally and wonder if they might work. I miss all the Asian Markets that were available when I lived in Nashville. Posted September 28th, 2016 at 6:05 am | Log in to reply. HI,Maangchi !I want to ask do we need to wash way the salt in the peppers? Posted September 28th, 2016 at 9:22 am | Log in to reply. Posted September 28th, 2016 at 3:44 am | Log in to reply. Hi Maangchi, what is Your meaning about big variety of Mexican sorts of red pepper? Do You use them in culinary practice? I’m missing “Chipotles” – it is difficult to find them in Russia. Posted September 27th, 2016 at 11:12 pm | Log in to reply. Maangchi knows peppers! First pickled (with a squirt!) and now fixed similar to oi-sobagi! Love it! Oi-sobagi is my favorite kimchi banchan, but this might beat it out! Thanks, Maangchi!!! This recipe was originally posted on September 27, 2016 at 9:32 pm by Maangchi. The video was watched 657,133 times on YouTube & has 11,127 likes!